The FURUNO MU190 is a multi-purpose marine LCD that features the unmatched quality and reliability that you have learned to depend on. The MU190 employs a bright (450 cd/m2 ) color TFT LCD with special AR (anti-reflective) glass filter to cut down on annoying glare. With its bright colors, excellent contrast and wide viewing angles. The MU190 features SXGA (1280 x 1024) screen resolution and a wide range of interface options available that include: 1 RGB analog, 2 DVI (Digital Video Interface) and 1 NTSC/PAL video inputs. 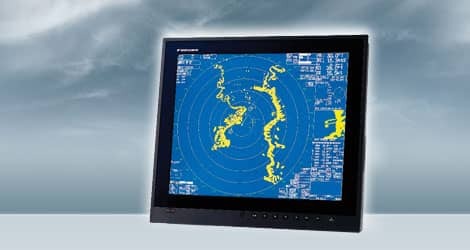 The display may be used as either the main or remote display for a variety of marine equipment, such as Black Box Radar, Sounder, Sonar, or NavNet series. The unit can also display images from security cameras, DVD player, computers, or other peripheral video devices. When pedestal mounting the standard FAR21x7 display unit MU190, the FAR2XX7PED requires use of the optional display mounting kit FAR-190-BKT, which includes the 008-535-560 bracket and 001-139-360 mounting assembly. Please note that the FAR-190-BKT kit is NOT supplied with the MU190 when the monitor is purchased as an individual component. When retrofitting for an older FAR21x7 monitor installation with an existing 008-535-560 bracket, the use of the 001-139-360 mounting assembly only is required. Customizable input names for easy on-the-fly identification and switching between onboard Radar, Sonar, Sounder, Camera, etc.